For years I have made Linguine with clam sauce, 1) with a tomato sauce base and 2) using the canned clams. 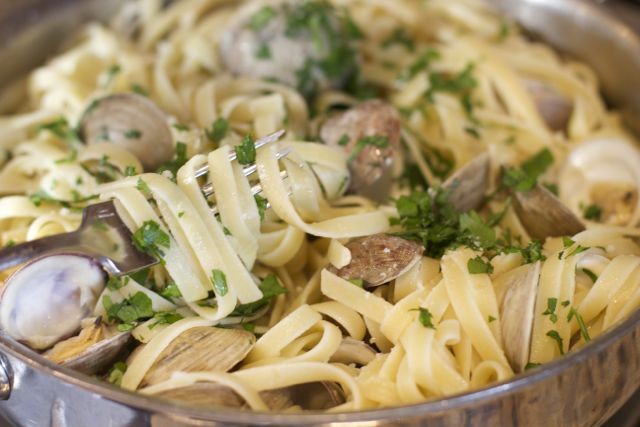 After making Linguine with Fresh Clam Sauce a few times, I am not sure I can go back, especially since the kids had so much fun eating them out of the shells. I knew it would be a hit because they have ordered them at a restaurant before. (Yes my kids have the pallete of a sophisticated adult). 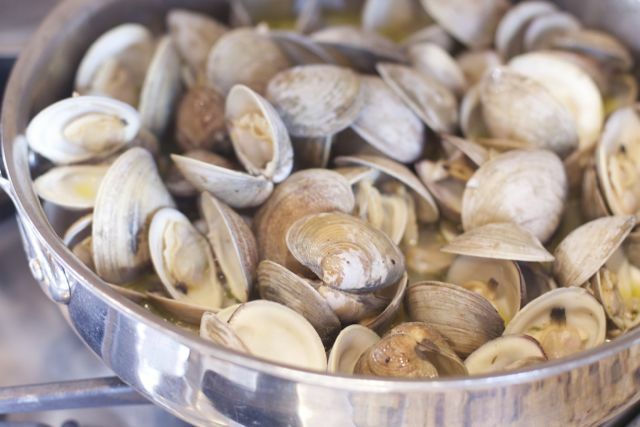 I think the idea of using fresh clams was intimating at first but really it is an inexpensive dish that can serve the whole family. At our grocery, I purchased 2 lbs of clams for 6.99. Add a box of two dollar pasta and you have a dinner for 4 for under $10. Not to mention this pasta dish looks like something you can only get at a nice Italian restaurant takes under 30 minutes to make. After looking at few recipe books, I used most of the techniques from the cook book, How to Cook Everything by Mark Bittman. The one thing I was not sure about from his recipe was he said don’t worry if a clam does not open just do it yourself. So many times I have heard that you should throw them away if they did not open. Needless to say I was not going to test this theory on my children, luckily this batch of clams all opened for me. I also modified the recipe just slightly to add a little kick with extra red pepper flakes. If you don’t like to cook with wine, add vegetable broth or clam juice you can find at the grocery store. This is a two pot meal, which makes clean up a breeze. If you can boil pasta and heat oil you have yourself a gourmet meal on the table in 30 minutes. After they have steamed for a few minutes. Rinse and clean your clams. While the pasta cooks make the clam sauce. 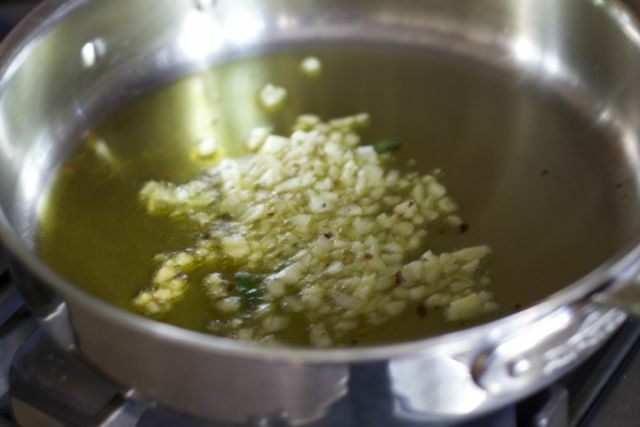 Heat the olive oil in a large saute pan over medium-low heat. Add the garlic and cook until softened but not browned, about 3 minutes. Add the pepper flakes and cook for 30 seconds more. Add the wine and water and increase the heat to high. Allow the mixture to reduce to half. Add the clams, cover, and cook, shaking the pan periodically, until all the clams are opened, about 6 minutes. Drain the pasta and add to the clam sauce. Add the parsley and toss to combine. Season with salt and pepper to taste. Divide among heated bowls and serve immediately with grated parmesan cheese. 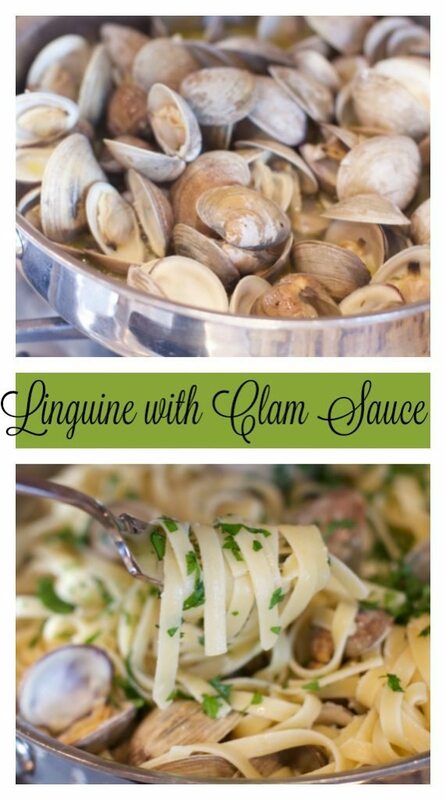 Have you ever made Linguine with Fresh Clam Sauce before? 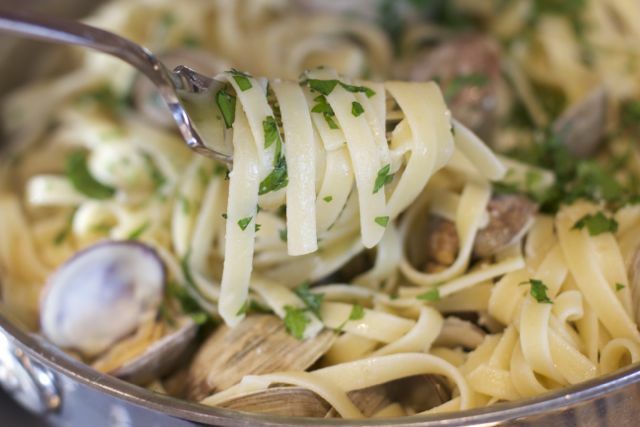 Do you prefer red or white linguine with clam sauce? 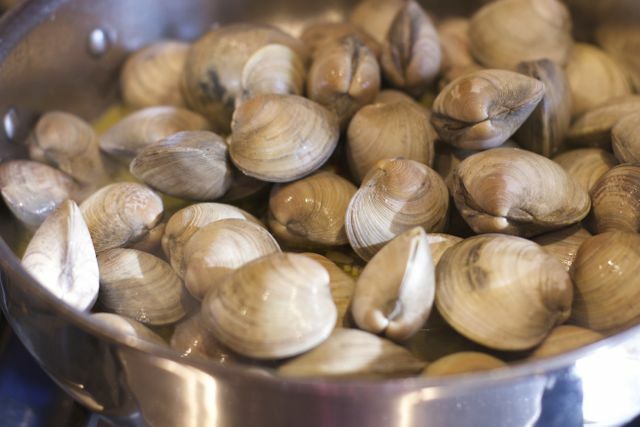 I haven’t made clams in years…your recipe looks so easy, I cant’ wait to give it a try. Yum! 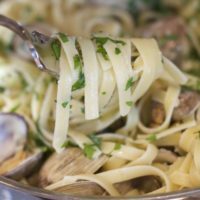 I absolutely love linguine with clams and am always looking for new recipes to try. This one sounds delicious. I love the red pepper flakes! Hey I never prepared pasta with clams. Nice recipe and loved your explanation. Will try this one out. Perfect! I can get littlenecks at the farmer’s market (yes, we extend farmer to include local fishermen!) and keep thinking I should really find a recipe for clam sauce… And now I have one! This is one of my favorite dishes and I haven’t made it in forever. That changes this weekend! Thanks for the inspiration — oh and BTW – I love kids that eat everything. My daughter has the same kind of adventurous palate. When she was 7 we went to a restaurant in the Florida Keys — and she ordered oysters on the half shell. The waiter asked “how many?” She looked at me and my husband and said to him, “Well, I think we’re gonna need at least a dozen!” LOL! Thanks for linking up with the Planet Weidknecht Wet and Windy Weekend Hop!